It's quicker and easier to get around the app and control it from the keyboard. Apple released iTunes 12.4, changing a number of interface elements users had become familiar with for navigating their iTunes libraries. There are fewer buttons, and the interface is less cluttered (at least that’s my opinion) but some users are lamenting the loss of some of these buttons and menus which allowed them to move around iTunes with just a few clicks. It’s true that, for some features, you now need to click a bit more. For example, there was previously a row of icons near the top left of the iTunes window. These icons let you change media libraries, going from Music to Movies, or TV Shows to Audiobooks. But now, there’s a menu that Apple calls the Media Picker; you need to click that menu to choose a media library. Actually, there’s another, quicker way to switch media libraries. You can do this from the keyboard. 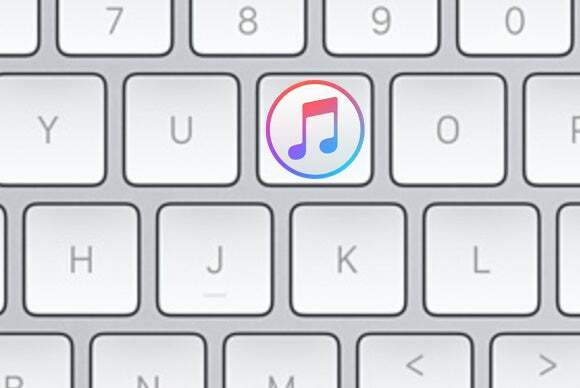 And there are lots of other keyboard shortcuts you can use in iTunes to save time. Here’s on overview of the most useful ones. In addition to using the Media Picker, you can also access media libraries from the View menu. Choose View > Media Kind, and you’ll see a sub-menu with all of the libraries. This menu shows you keyboard shortcuts for switching media libraries. To switch to your Music library, press Command-1. For your podcasts, it’s Command-4. And so on. Remember these shortcuts, and you’ll save a lot of time. 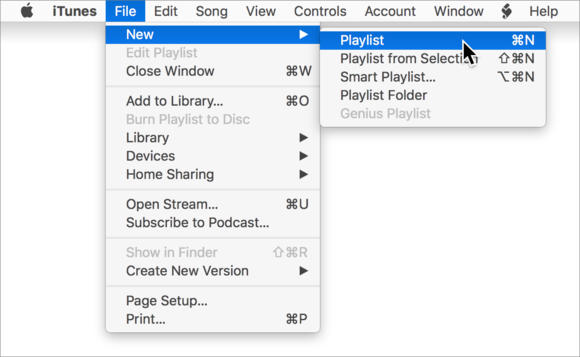 There used to be buttons at the bottom left of the iTunes window, which you could click to create playlists and playlist folders. They’re gone now. You can right-click in the sidebar and display a contextual menu which offers these options, but only at specific locations: at the header that says Music Playlists or All Playlists, or below the playlists. If you have a lot of playlists, you have to scroll to the bottom of the list, and the target is quite small. Use the keyboard. As you can see in the File > New menu, there are shortcuts for new Playlist, Playlist from Selection, Smart Playlist, but not Playlist Folder. You can create playlists from this menu, or by using the keyboard shortcuts you see here. You can use keyboard shortcuts to create new playlists, and you can even set up your own shortcut using this method if you create playlist folders often. iTunes 12.4 has Back and Forward buttons, similar to those you find in a web browser. You can use these to move around iTunes. For example, if you’re in your music library and you then go to the iTunes Store to look for new album by your favorite band, you may want to go back to check what’s in your library. You can click the Back button, look at the band’s music, then click the Forward button to go the the iTunes Store again. But you don’t need to use these buttons. You can press Command-[ to go back, and Command-] to go forward. But you can also do this from the keyboard. 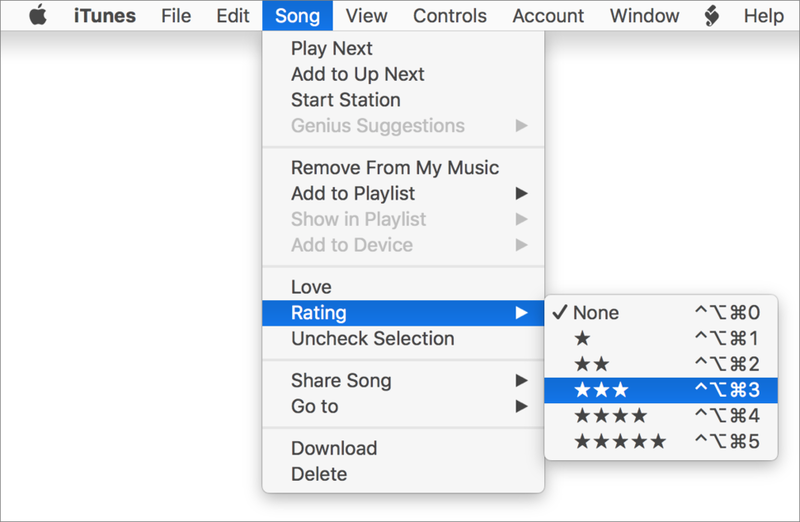 While there are some third-party iTunes controllers that offer this feature, you can set up keyboard shortcuts in System Preferences that use the ★ characters in the Rating menu. See this article to find out how to do this. Create your own shortcuts to rate your music from the keyboard. You can set ratings from None to ★★★★★ from the keyboard with this method. There are other controls you can access from the keyboard. Press the spacebar to play and pause your music and videos. Command-up-arrow and Command-down-arrow turns the volume up and down. Command-right-arrow goes to the next track in an album or playlist, and Command-left-arrow goes to the previous track. Note that if you’re further into a track than a few seconds, Command-left-arrow takes you to the beginning of the track; press it again to go to the previous track. Command-period stops whatever is playing and clears the iTunes LCD. If you’re not used to using keyboard shortcuts with iTunes, take some time to learn some of these. It’s quicker and easier to get around the app and control it from the keyboard.